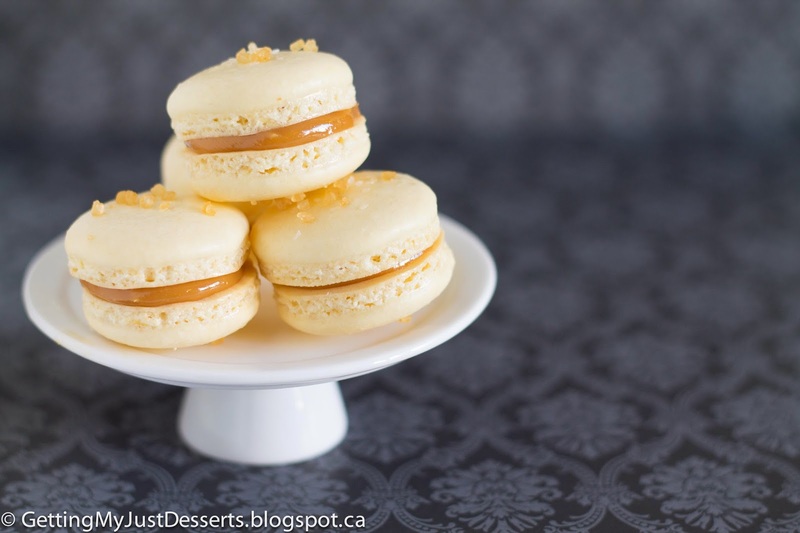 Welcome to my latest obsession ... macarons! Okay, I guess it's not a full blown obsession yet but it's probably not a good sign when your mother bets your sister $5 that you'll be dropping by with macarons ... even before you've told them you're making some. I made my first batch last week and the picture above is probably my 5th or 6th batch. To be fair it took me about 2 to 3 batches before I finally got these puppies right. 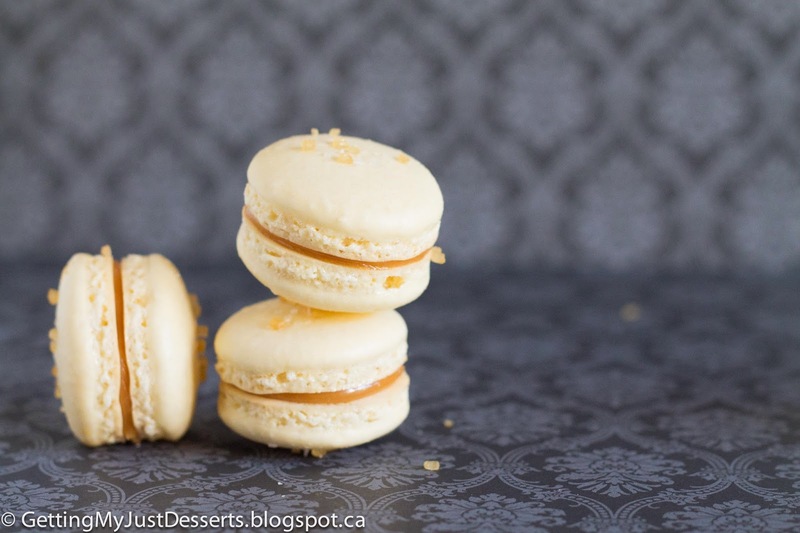 I had definitely heard the horror stories about making macarons .. they crack, they are too flat, they don't get the 'foot' on the bottom, they're too chewey, they're too hard...and the like. So I did what I always do when something seems difficult, go into research mode! I found this amazing tutorial on ohsopretty.com. She details everything so perfectly that it was honestly hard to fail at this. 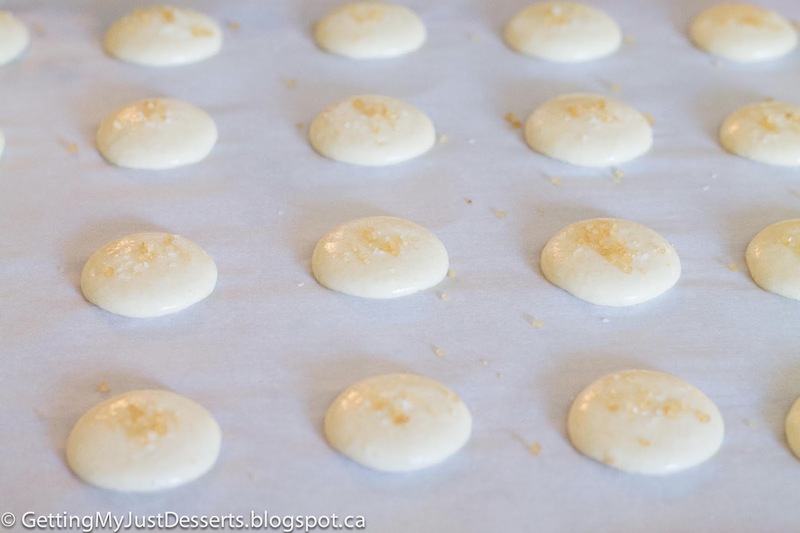 The hardest part is incorporating your almonds/icing sugar into your egg whites ... if you mix too much, you get flat macarons ... if you mix too little, they crack. I also used her recipe which I am really liking. Read her tutorial, it's fantastic! 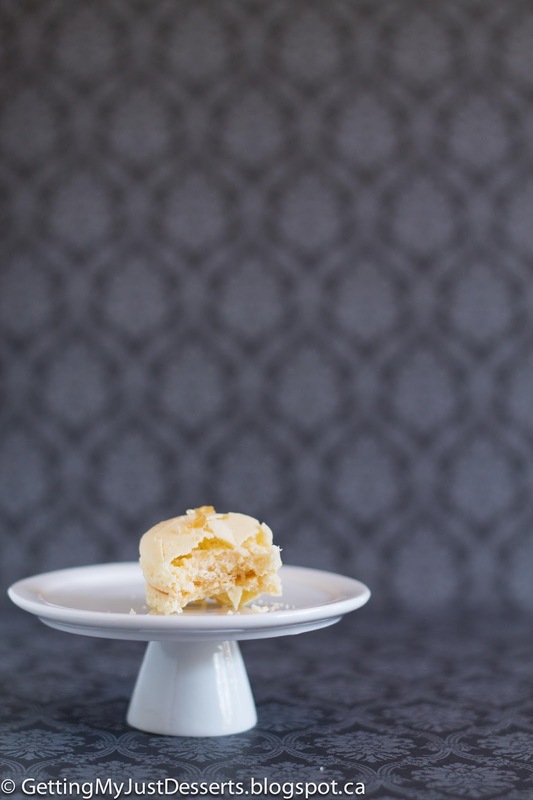 Using a #12 Wilton round tip, set up your icing bag and place it in a tall glass or vase (see picture below). 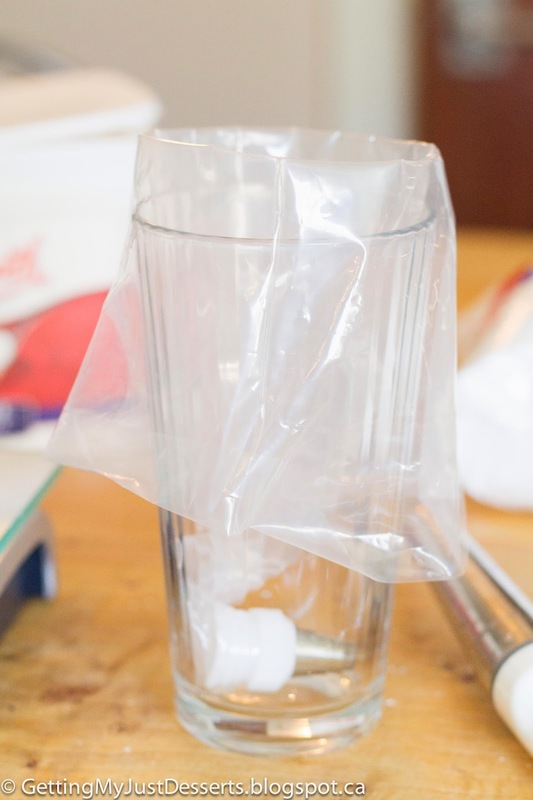 This tip makes it easier to fill an icing bag without needing a mysterious third arm. Also, get out a large baking tray and line it with either a silpat and/or parchment paper. I used both. 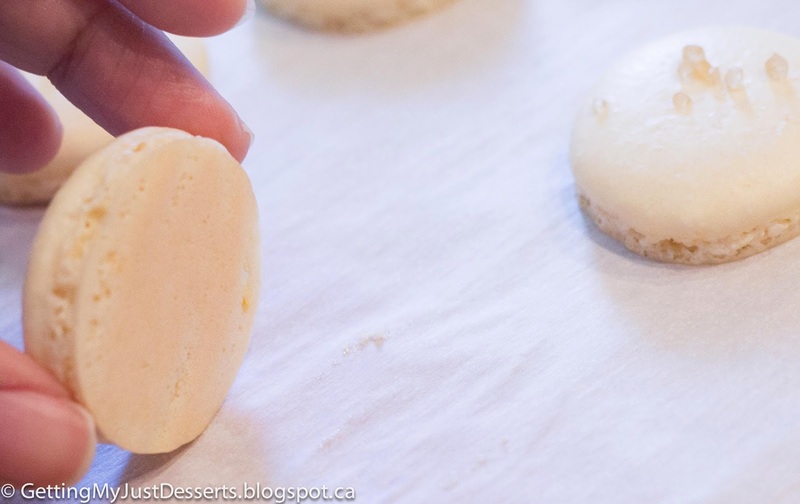 If you are meticulous about the size of your macarons, you might want to trace circles on your parchment paper using either a small cookie cutter or a shot glass. 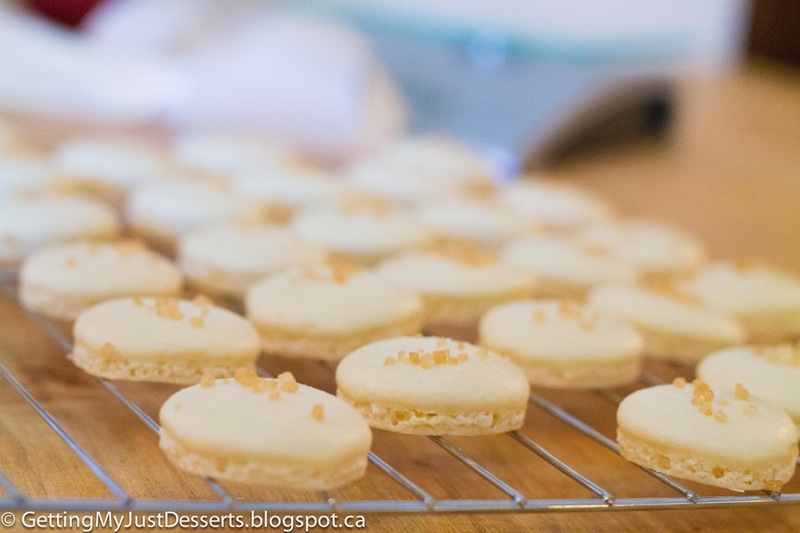 Make sure the marks are face down so you don't bake pen or pencil into your macarons ... gross. 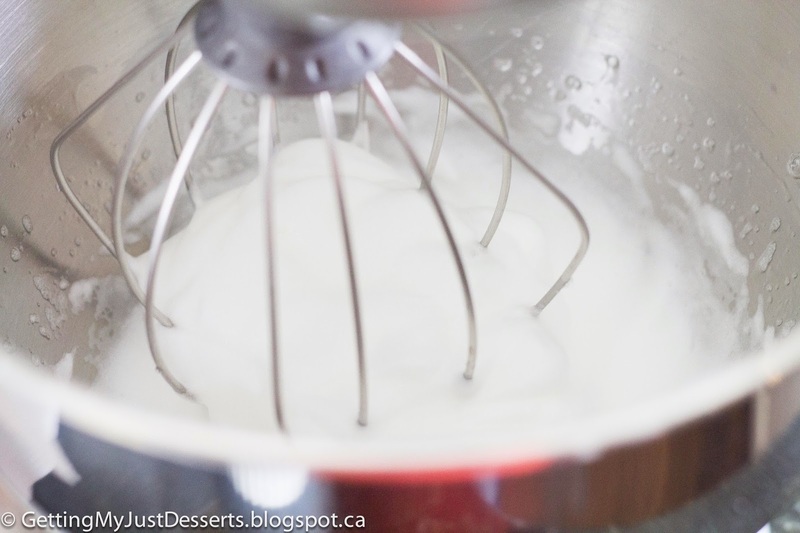 In the (very clean and VERY DRY) bowl of your stand mixer, whip your egg whites. If there is any moisture in the bowl or if any of the yolk gets in there, you should just cut your losses and start again. Your whites won't whip. 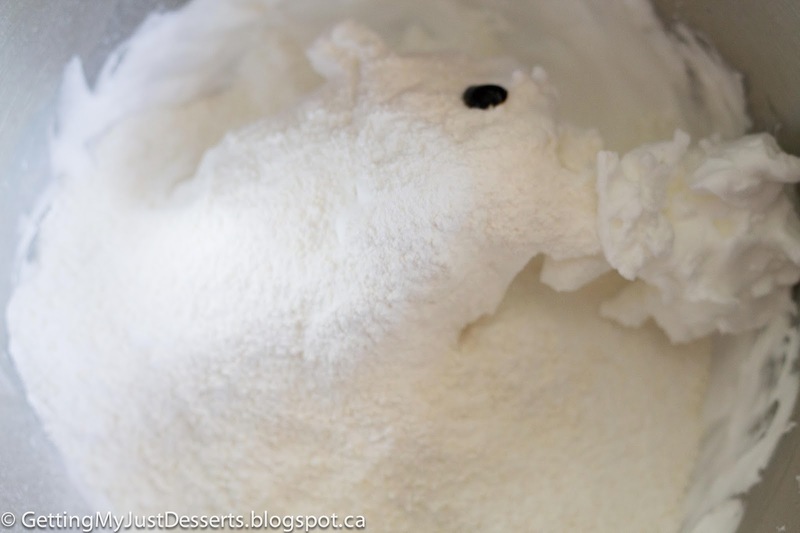 Once they start to look white and foamy (like the pic below), gradually add your 30 gms of sugar. Keep whipping while you do the next step. 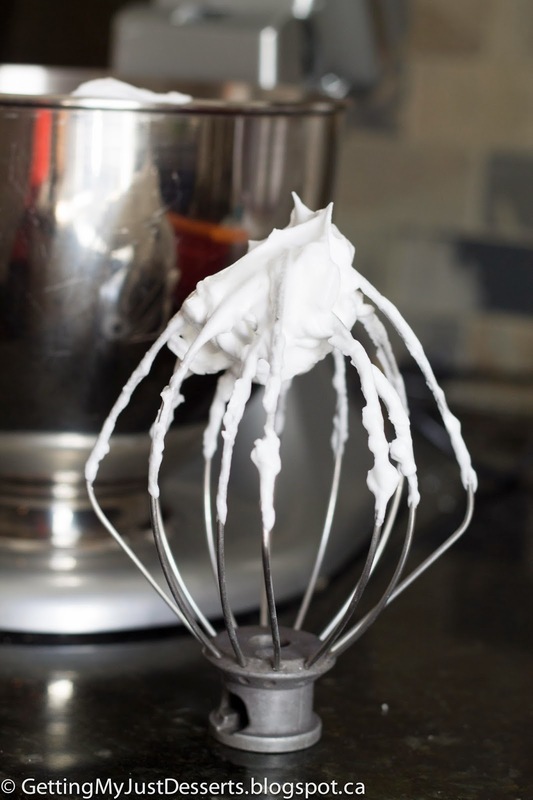 You want your egg whites to get nice and stiff. 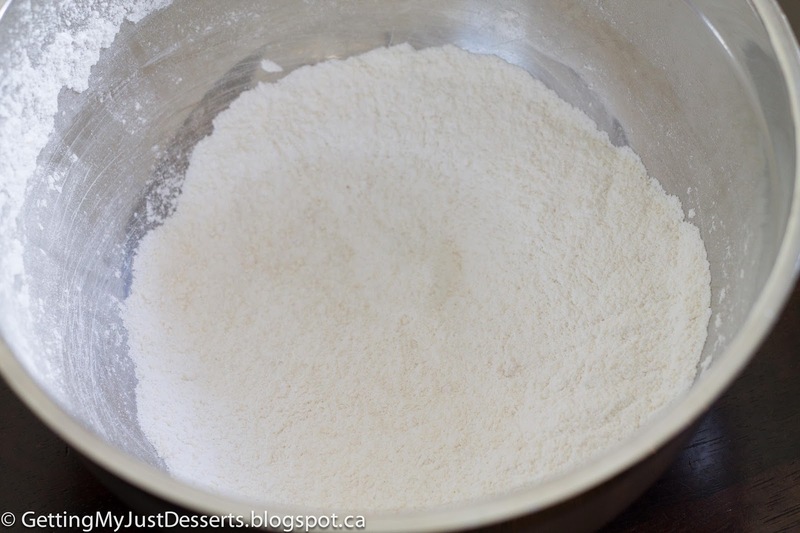 In another bowl add your icing sugar and the almond meal. Sift these together. This will ensure a smooth top. Confession time ... 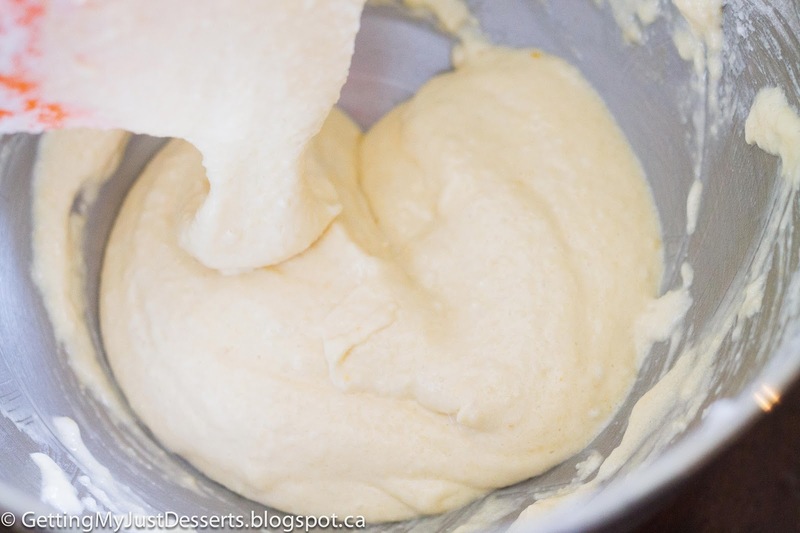 I didn't have a big sifter, so I took a whisk and whisked these together. Not as good as sifting, but it has worked pretty well for me. 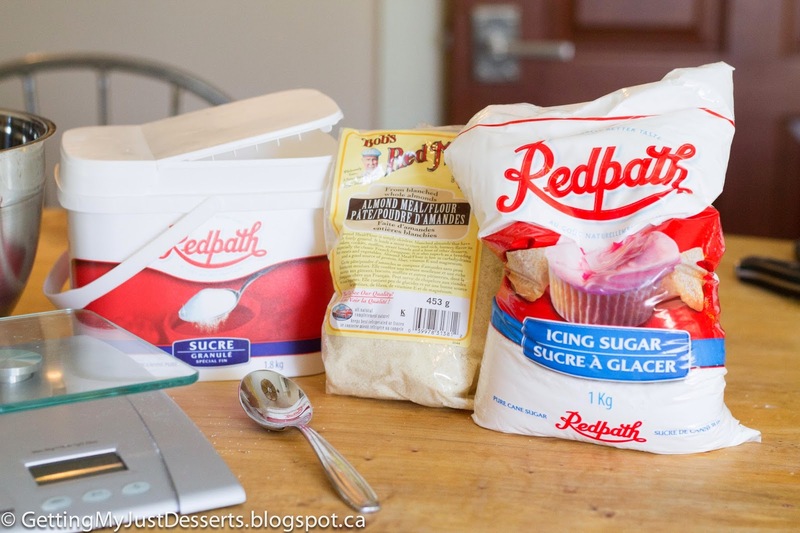 Picture of the whisked ingredients below. 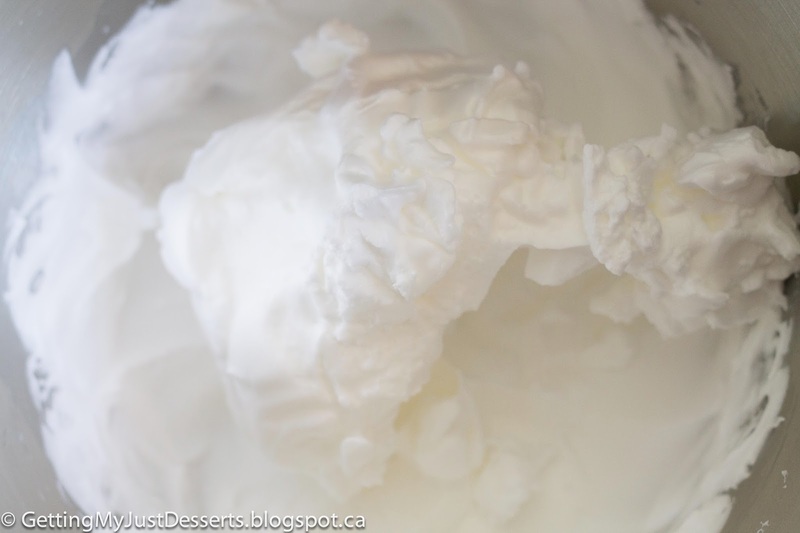 When your egg whites are nice and stiff (like the pictures below), remove it from your mixer. Add the dry ingredients and your food colouring. I like to add the colour in now because I find if you add it to your egg whites while they are still whipping, they don't get as stiff. 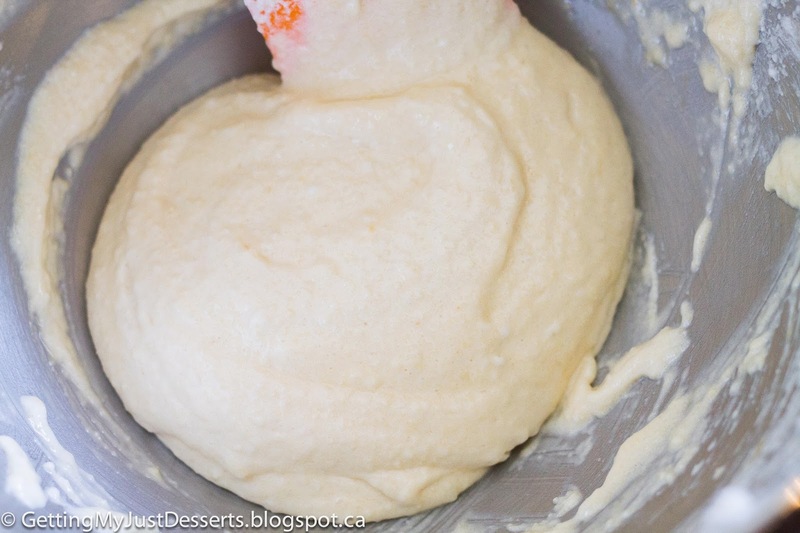 Using a dry spatula, gently fold your dry ingredients into your wet ones. Do it gently. Not sure how to fold? Watch this video. Actually, just watch this video anyway, it's awesome. You want to keep folding until your mixture looks like the pics below. Just until it will run off your spatula without breaking. Then fill your waiting icing bag. 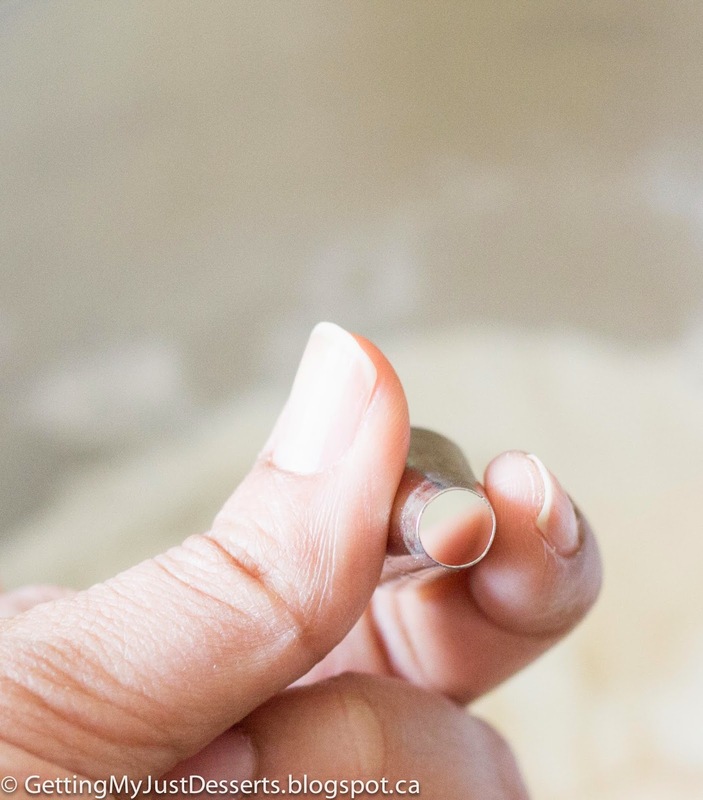 Pipe little discs onto your waiting baking sheet by holding the bag in one place (don't swirl the bag around as you pipe). Just simply press he desired amount on the tray and when your done stop and flick your wrist a little so you don't have a pointy top. 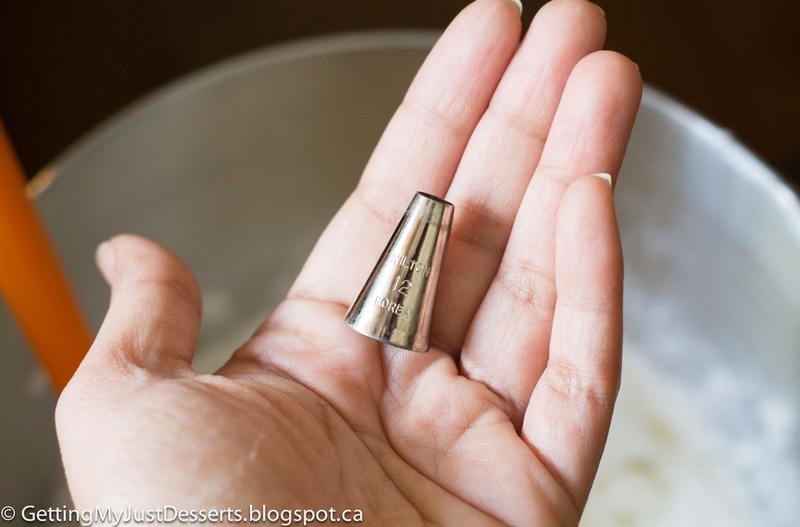 If you folded your mixture to the right consistency, those little tops will go away. 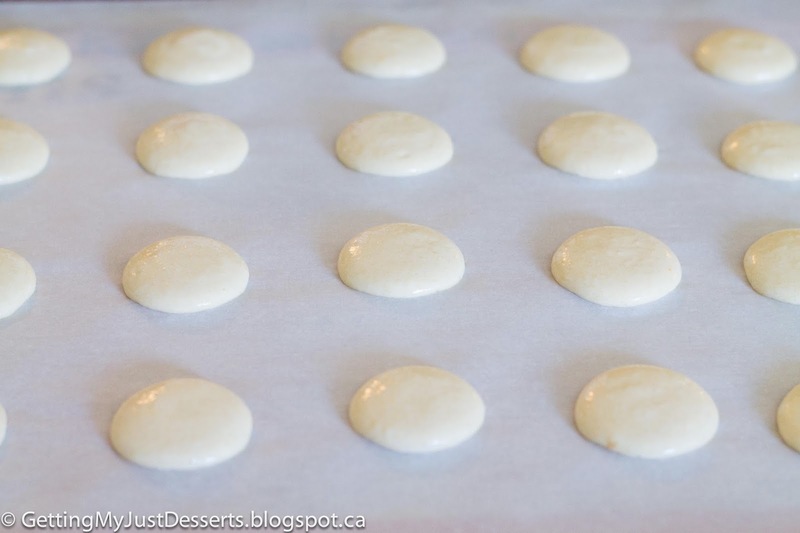 Give your baking tray a few firm taps on your counter top to bring any air bubbles to the top. Use a toothpick and pop any bubbles that rise to the top. 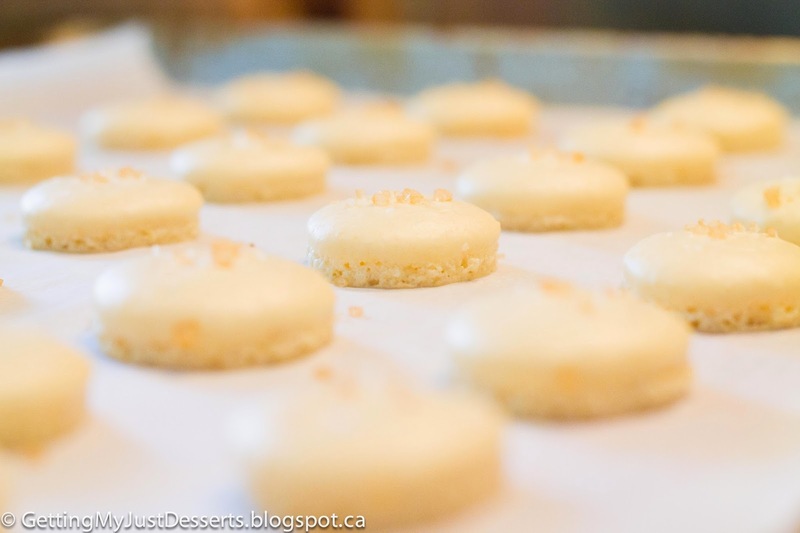 Set your oven to 325 degrees F.
Let the tray sit on your counter for 10-15 minutes until the tops of your macarons are dry to the touch. 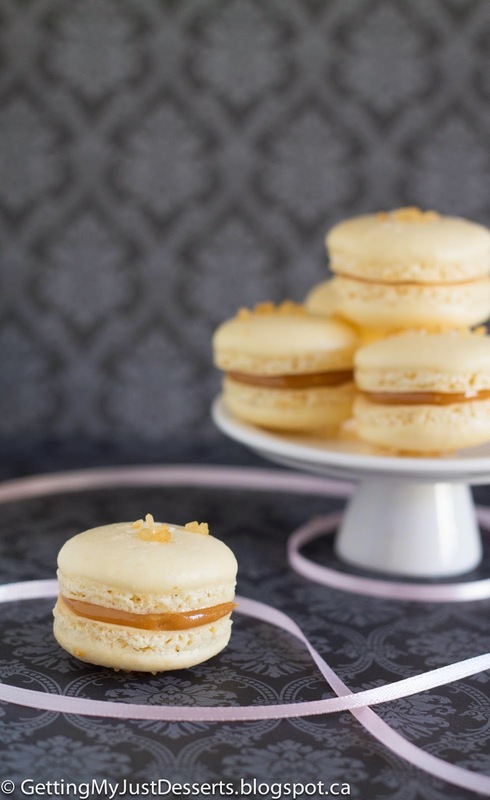 This is what gives the macarons their signature 'feet'. Sprinkle with salt and turbinado sugar if desired. 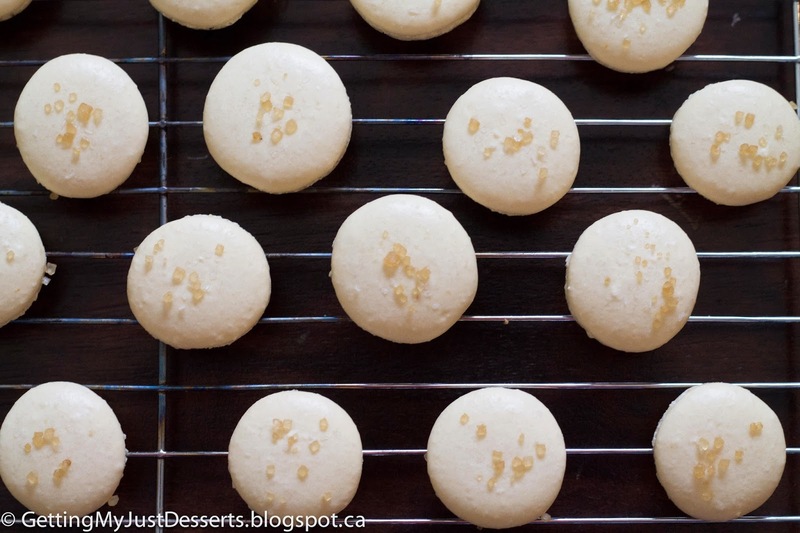 Place your macarons in the oven at 325 degrees for 10 minutes. I like to rotate the tray halfway through the baking time. Then reduce your oven to 275 degrees for 6 minutes ... again I rotate half way through. You should see the 'feet' after the first 10 minutes of baking. When they're done the bottoms should be lightly brown but the tops shouldn't be brown at all. Let cool. If you baked them enough, they should come off your baking sheet easily. 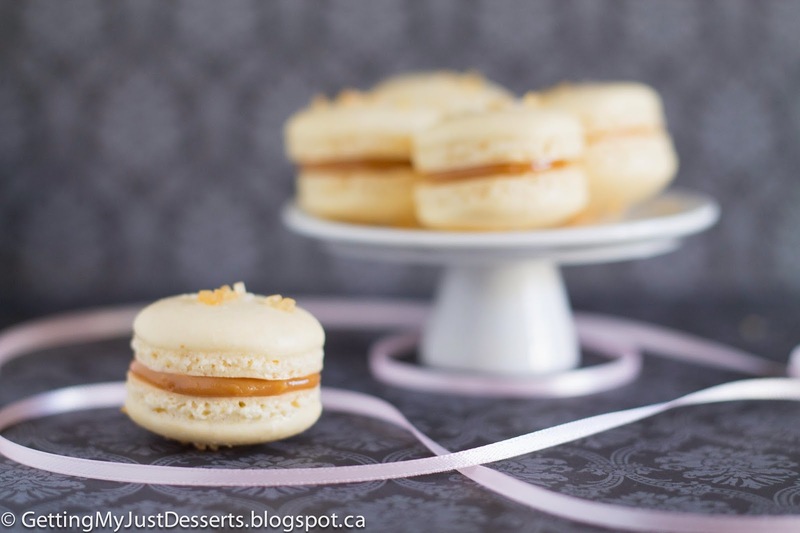 I made an easy dulce de leche sauce, but it takes forever. I made it by boiling a can of sweetened condensed milk ... and I do mean boiling the entire can. Google it. My only tip here is to make sure the entire can is submerged while boiling. 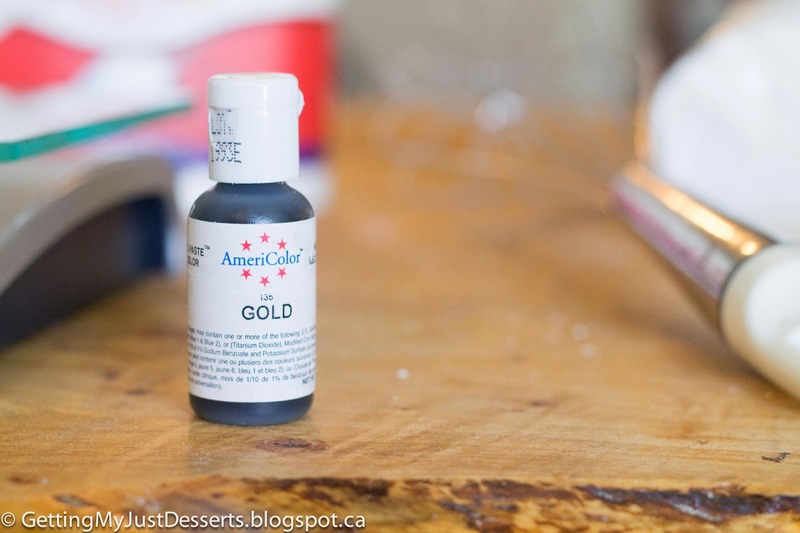 This ensures that the can won't explode, and that your caramel will be evenly browned throughout the can. If you don't like this method, feel free to use any caramel you like ... even store bought. And that's it! Done! Voila! Be ready for the oooo's and ahhhh's!